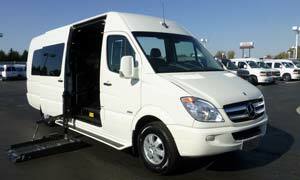 Mobility Vans are handicapped accessible vans that are fitted professionally with a device to assist in the entry, exit, or operation of the van. There are many different applications available for mobility vans including wheel chair lifts, scooter ramps or carriers, and transfer seats. Other applications for mobility vans assist in operation. Effortless steering, hand controls for throttle and braking, raised doors, lowered floors, and electric emergency brakes all assist in operating mobility vans. If you have questions about mobility vans, please don’t hesitate to give us a call. Our mobility van experts are here to answer your questions and concerns.